Central Adoption Resource Authority (CARA) has been set up as an autonomous body of the Ministry of Women and Child Development which functions as a nodal body for adoption of Indian children and is mandated to monitor and regulate in-country and inter-country adoption. 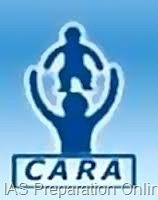 CARA is designated as the Central Authority to deal with inter-country adoptions in accordance with the provisions of the Hague Conventions on Inter-Country Adoptions, 1993, ratified by Government of India in 2003. CARA interacts with State Governments and UT Administrations through regular training and orientation programmes as well as meetings, consultations and visits to the States/UTs. The implementation of the adoption programme in the States/UTs is reviewed in various consultations organized by the Ministry as well as meetings of the Project Approval Board to consider proposals received from States/UTs for release of grants under the Integrated Child Protection Scheme.